Cranberries are one of those fruits that just don't get used enough. We love them in the wheat-free kitchen (they're especially good in our cranberry muffins recipe). 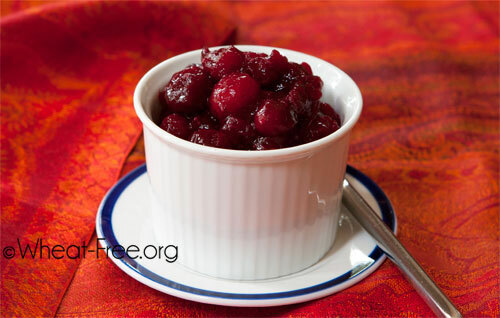 This cranberry sauce recipe is perfect for Thanksgiving or Christmas dinner, and it's so quick and easy to make that you'll never buy readymade again. If you've got 15 minutes you've got fresh, homemade cranberry sauce. Put all the ingredients in a saucepan and gently heat until the frozen cranberries (if used) have defrosted. Bring contents to the boil, if the mixture appears too thick then thin it down to your preferred consistency using small amounts of water. Turn the heat down and gently simmer for 5 minutes. Cranberry sauce isn't just for serving with the turkey at Christmas and Thanksgiving. It's absolutely great with cheeses or other meats. Why not use cranberry sauce instead of butter or mayo in your sandwich? Or with brie on gluten free crackers? Use it wherever you would use pickles, relishes or chutneys, you'll be converted... and it's lower calorie than many relishes or chutneys too.